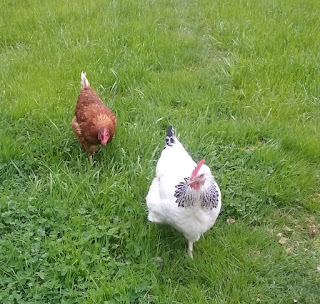 The white one is called Daisy and has been with me since November - being a pure bred she took over 30 weeks before she grew into a laying hen, also taking all those months to get friendly, but as you can see whenever I venture outside she rushes over to me, talking all the time. The Isa Brown is the 3rd one, the 1st escaping when we had winds and she squeezed through the fence, the 2nd died in the heat of Summer .... but this one - Girlie is so cheeky and tries to boss Daisy. I am not sure who wins. But its very difficult to weed the garden they are on to of the fork where I am working, chatting all the time. If I try to sneak a bit further down they just rush and follow me. and they give me an egg a day each. Love your 'Daisy." what kind is she? Molly .... they almost seem human sometimes. Daisy is a Sussex - they take longer to settle in but once they are your friend - well - . They chatter away whenever I go out to them. Have you noticed how yellow the yolks are compared to the bought ones. Pity I cant bring some to you.